Dr. Frank Agullo specializes in all types of facial cosmetic procedures, including lip augmentation in El Paso and Southwestern Texas. His double board certification both in Plastic Surgery and General Surgery makes him qualified to perform cosmetic lip enhancements either as part of another face lift procedure or as a standalone cosmetic enhancement to reveal fuller, plumper and lovelier lips! Have you ever studied your lips and wished they were plumper, fuller, or sexier? Do you notice fine lines and wrinkles around your lips that seemed to creep up unexpectedly? Your lips are like the doorway to your smile, and therefore one of the most important features of your face. People who have thin lips or lips that are crooked, lack definition or just have many fine lines both on the lips or just surrounding their lips may feel self-conscious about smiling or appearing in photographs. The good news is that lip augmentation these days is a very straightforward and easy procedure as compared to many other types of corrective cosmetic enhancements. The most common form of lip augmentation entails the use of injectables dermal filler like Juvederm or Restylane. These fillers are smooth gels which are synthetic and comprised of hyaluronic acid (HA). These fillers are comprised of substances similar to the hyaluronic acid found in your body; therefore many people refer to them as hyaluronic acid fillers. Another option is the use of your own fat which is transferred from another area of your body. 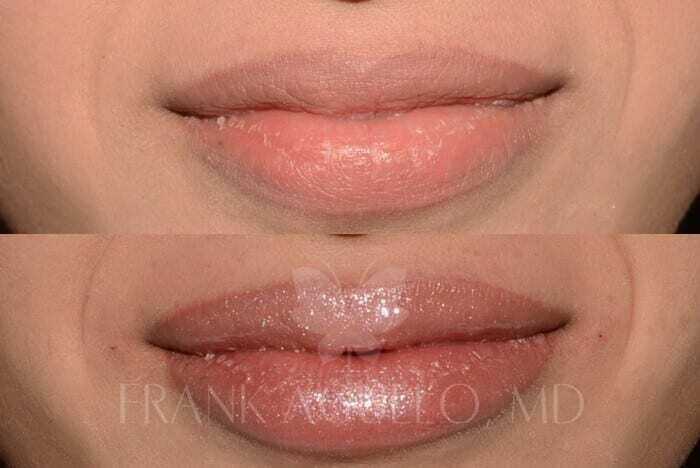 The dermal fillers are absorbed into the lips to create fuller lips; however, this option is temporary and must be repeated with additional treatments to maintain a long-lasting effect. A longer lasting procedure would entail the use of your own fat or implants, such as PermaLip by Surgisil or AlloDerm fillers that yield long-term luscious lips. Fat injections offer permanent results, although the amount of fat retained after injection is variable. The procedure need to be repeated until the desired results are obtained. The doctor doesn’t need to perform lip augmentation in the operation room, such as that of other facial surgeries. Local anesthesia is often enough to perform the procedure. Unlike many more complicated procedures, lip augmentation can be performed fairly quickly in Dr. Agullo’s office. You won’t have the same hassle of needing to take time off from work (unless you want to) so the relatively low downtime is attractive as a cosmetic procedure. The doctor will apply a local numbing solution topically to assist with any discomfort. This is just like going to the dentist, except your lips may feel numb. The doctor then marks the lips with a special pen and uses extremely fine needles to inject the filler into your lips. You’ll want to ice your lips to help with any swelling or discomfort, but don’t put pressure on the treated areas. Avoid using lipstick and other lip products. Your lips will feel strangely fuller and within a few days you can start revealing them to the world, either with or without lipstick. Are there any side effects to lip augmentation? The effects of lip augmentation are less extreme than other types of facial cosmetic procedures. However, it is important to know of any risks prior to undertaking any kind of changes to your body and to ensure that you take the proper precautions to avoid risks and complications. It is important to choose an appropriate provider for your lip augmentation. It may seem like a simpler procedure than some that require incisions; however it can be dangerous to let someone who is inexperienced give you injections in such a sensitive area of your body. Choose a doctor who is board certified and who has the know-how to do your lips a service. Dr. Agullo is meticulous about the quality of his treatments and his patient’s comfort level while going through lip augmentation. He was recently recognized as a “Texas Superdoctor Rising Star” in cosmetic and reconstructive surgery in Texas Monthly and his practice is based at Southwest Plastic surgery. Most often, lip augmentation is priced according to how many filler tubes are needed to properly improve the fine lines and plump up the lips to the patient’s liking. A cost is determined per needle and per visit, since for some patients it will require multiple treatments to achieve the desired results. After a successful lip augmentation, you may find your new lips to be fun and you may even be interested in buying a couple of new lipstick colors to show them off. Even better, you may find yourself smiling a whole lot more as your plump, full lips give way to the beautiful person you are! You’ll be smiling a whole lot more after El Paso lip enhancement.